Kathleen Kaska describes herself as curious, obsessive, impatient, creative, and nice. Her writing is funny, lighthearted, serious, personal, and unpredictable. Intriguing answers, don't you think? Here are her choice questions and responses. That’s a tough question. Who I invited and where we’d dine would depend on my mood, but since I’ve been a bit homesick lately, I’d invited my three wonderful and very lively sisters who live in our home state of Texas. We’d eat at any causal restaurant that served Texas’ own Shiner Bock beer and wouldn’t ask us to leave if we got rowdy. There’s a great pizza place in Austin, Texas called the Pint House that meets the criteria. The pizza is fabulous and the crowd is loud, so we’d fit right in. My most productive writing venue is usually my desk in my room. It’s quiet and my books and files are within reach. However, when I hit a roadblock, I pack my laptop and head to one of many local coffee shops. For some reason, the background chatter doesn’t seem to bother me and the change of location, along with the caffeine, helps get me back on track. Beyond great writing, a great story needs a main character who readers can relate to; a setting powerful enough to act as a character itself; and a cleverly written plot. I read about ten books a month. I do read in my genre (mystery), but I also read fiction and nonfiction books on topics I’m passionate about: birds, ancient Egypt, travel, food, environmental issues, and poetry, just to name a few. I just read Damn Yankees: Twenty-Four Major League Writers on the World’s Most Loved (and Hated) Team edited by Rob Fleder. Oh, I’m passionate about baseball, too. I have two mystery series, one published and one I’m still shopping around. 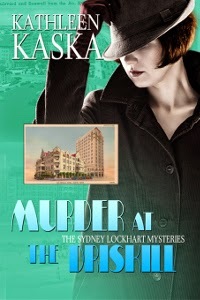 My published series, the Sydney Lockhart Mystery Series, is set in the 1950s; and my other series is set in current times. Both focus on strong women claiming their power in a man’s world. Despite my time being my own, I struggle with getting things finished, not that I miss deadlines— that never happens. I just have a lot of projects I’m working on. When I start to feel stressed about my own imposed deadlines, I make a list of priorities and follow it. I’m motivated by a strong desire to tell a story, and since my Sydney Lockhart series is lighthearted and humorous, I’m also want to make people laugh. For more information about Kathleen and her books, check out my blog and website at www.kathleenkaska.com; www.kathleenkaskawrites.blogspot.com. Catch me on Facebook at https://www.facebook.com/kathleenkaska and on Twitter at https://twitter.com/KKaskaAuthor. You’d think that newspaper reporter Sydney Lockhart, comfortable at home in Austin, Texas, could stay away from hotels and murders therein. But when she and her detective boyfriend, Ralph Dixon, hang out a shingle for their new detective agency, they immediately land a high-profile case, which sends them to the swanky Driskill Hotel. Businessman Stringer Maynard has invited them to a party to meet his partner/brother-in-law, Leland Tatum, who’s about to announce his candidacy for governor. Maynard needs their help because Tatum is hanging out with the wrong crowd and jeopardizing his chances for winning the election. Before Sydney can finish her first martini, a gunshot sounds and Leland Tatum is found murdered in a suite down the hall. Thanks, Jim, for having me as a guest today on My Two Cents Worth. I'd love to hear from your readers about what motivates them to write. Hi Kathleen -- Thanks for your interesting answers today. I wonder how many writers add to their stress by taking on too much. I'd have to say that is one of my issues. So many interesting things to write about; so much time necessary to publicize our work--and still only 24 hours in the day. Your are so right, Jim. Nowadays writers have to do so much more than write. Your setting of the 1950s, Kathleen, sounds hard to write. I've always admired historical writers who make the era come alive and get the details right. Since I was born in 55, I don't remember much of it. How do you get the slang and other details right? Do you emerce yourself in research before you start? I was born in 1952 and those memories—the styles; music; movies—are still so vivid. As far as the 1950s slang, I simply googled "1950s slang." But what helps me the most is reading books written in the 40s and 50s and reading old newspapers. It sounds like an interesting series, Kathleen. Since I was in high school and graduated in the 1950s, I think I'd enjoy your series. I hope so, Gloria. I truly enjoy writing this series.